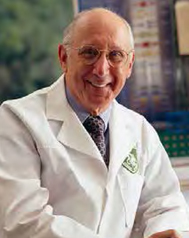 Pioneered the use of adoptive immunotherapy. Chief of Surgery at the National Cancer Institute. Credited with developing the use of IL-2 and immune cells for the treatment of patients with melanoma in a procedure termed adoptive cell transfer. Has shown that expanding immune cells (known as tumor infiltrating lymphocytes) in the lab can be used to treat patients with melanoma.